RBA remains on hold with no hikes expected until 2020. The Australian government bond yield curve steepened with the 10-year bond yield rising above the 3-year bond yield. The new levels of BBSW are beginning to take affect resulting in higher borrowing rates. The US 10-year bond ended the month at 3.06% with an intra month high of 3.116%. This compares with a closing level in August of 2.86%. It seems that financial markets had digested the trade war with China and took comfort from a new version of NAFTA. Equities rallied during the month and bonds sold off (higher yields). The benchmark US 10-year yield touched 3.11%, the top of the current range. The Federal Reserve delivered its third 25bp rate increase and is set to deliver the fourth hike in December. Bond yields fell slightly (higher prices) after the Central Bank’s move confirming that actions were as expected. We discussed last month the fact that bonds simply seem to be defining a new range. I expect the US 10-year bond to rise higher in an ever increasing range as the Federal Reserve continues to increase front end interest rates. The RBA remains on hold. As we approach the final quarter of 2018 we will switch to referencing the December 2019 pricing for the RBA Cash Rate. At month end it was indicating 1.66%, up 0.09% from the end of August. Many commentators are calling for RBA rates to be on hold until 2020. The 10-year Australian bond finished 15bps higher in yield at 2.67% with prices lower, giving up changes in yield seen the month before. The 10-year Australian government bond yield remains below the 10-year US government bond yield. This reflects the different paths each central bank is on. When the 10-year bond yield rises by more than the 3-year bond yield we can say the yield curve has steepened. This price action is not surprising if you expect the RBA to be on hold and therefore anchoring the front end of the yield curve. Credit spreads, or the premium required to hold a corporate bond instead of a government bond, have generally remained the same. 3-month BBSW was basically unchanged moving from 1.95% to 1.94.%. The new levels of BBSW are starting to reflect in higher borrowing rates. This is putting a constraint on the economy even though the RBA is not changing its official rate. The Bloomberg AusBond Composite Index for all maturities (the common benchmark) produced a negative return of 0.42% for the month reflecting higher yields (lower prices). 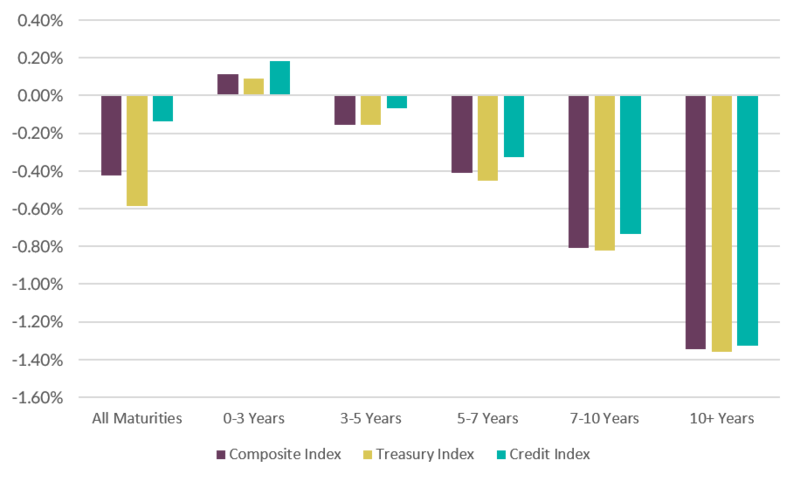 The Treasury Index (government bonds) for all maturities which is the single largest contributor to the composite index produced a negative 0.58% return.